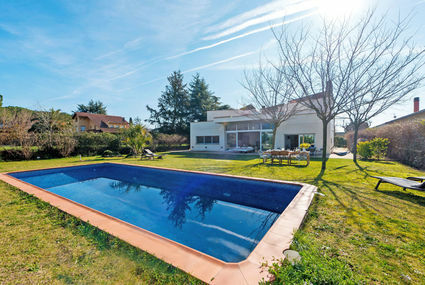 Sant Pere de Vilamajor 25 km from Mataro: Large, comfortable house "Sant Pere". In the resort 1 km from the centre of Sant Pere de Vilamajor, in a quiet, sunny position, 25 km from the sea, located by a road, in the countryside. Private: garden with lawn, swimming pool angular (23 x 6 m, depth 10 - 200 cm, 01.01.-31.12.) with internal staircase. Barbecue. In the house: central heating system (extra). Parking on the premises. Shop 1 km, restaurant 1 km, bus stop 1 km, railway station 6 km, sandy beach "Arenys de Mar / Mataró" 25 km. Golf course 15 km. Nearby attractions: Outlet La Roca company store 15 km. Please note: car recommended, no lift. Groups of teenagers on request only. Rustic house "Can Trullàs", 2 storeys, renovated in 1992. 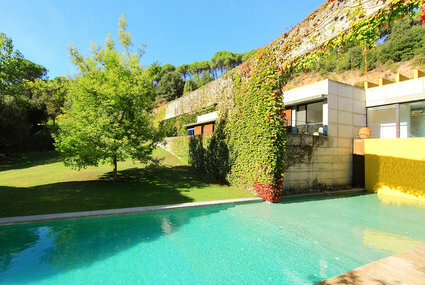 Outside the resort, 1 km from the centre of Viladecavalls, in a secluded, quiet, elevated position. Private: natural state property (fenced), swimming pool kidney shaped (depth 150 - 180 cm, 01.01.-31.12.). Table tennis, pergola (40 m2). Motor access (300 m via unmade road). Parking on the premises. Shop 1 km, grocery 1 km, restaurant 1 km, railway station 1.5 km. Nearby attractions: Montserrat 27 km, Barcelona 32 km. Please note: car recommended. Suitable for families. Groups of teenagers on request only. Neighbourhood highly sensitive to noise. Quietness and good behaviour expected. The house is situated in a 150 hectares estate with 2 more houses. Rustic house "Ca la Xell", 2 storeys, built in 1800, renovated. 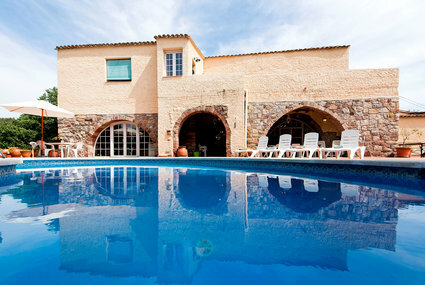 In the centre, on the outskirts, 1.5 km from the centre of Sant Antoli, in a quiet position. Private: garden with lawn 20 m2, swimming pool (2 x 4 m, 01.01.-31.12.). Terrace, garden furniture, barbecue, public car park at 30 m. Shop 8 km, grocery 1.5 km, restaurant 1.5 km, bus stop 1.5 km, railway station 8 km, outdoor swimming pool 1.5 km. Please note: no lift. Groups of teenagers on request only. 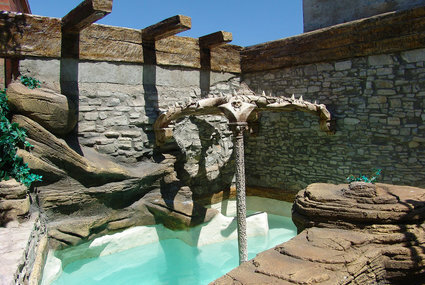 The swimmingpool is small and with rocks. Beautiful, comfortable house, 2 storeys. Outside the resort, 800 m from the centre of Sant Esteve de Palautordera, in a quiet, sunny position, 1 km from the edge of the forest. Private: natural state property 865 m2 (fenced), garden 677 m2, orchard, swimming pool (8 x 6 m, depth 60 - 190 cm, 01.05.-30.10.). Stepped path (2 steps) to the house. Parking (for 2 cars) at the house. Supermarket, restaurant, bar 600 m. Nearby attractions: Parque Natural del Montseny 2 km. Please note: car recommended, no lift. Groups of teenagers on request only. Neighbourhood highly sensitive to noise. Quietness and good behaviour expected.